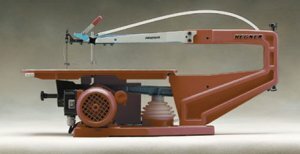 Remember that Hegner 22 inch scroll saw demo unit I told you about last month. Then is was listed for $1095.00 with $98 for shipping, but didnt sell. Now the price has been lowered and at 2 bids the price is currenty listed at $795.00 with $98 for shipping. An amazing deal if you ask me... if I only had the cash.